← Ipoh is Among Top 10 Places to Visit in Asia! I’m thrilled to announce that my second novel, When the Future Comes Too Soon, will be published on July 18, 2017, by Amazon Crossing! The book’s stunning front cover is below. This is the second book in The Malayan Series, but it is a stand-alone novel; in fact, all the books in the series will be stand-alone. In other words, every one of them can be read independently – you need not have read The Woman Who Breathed Two Worlds before being able to enjoy this latest book! 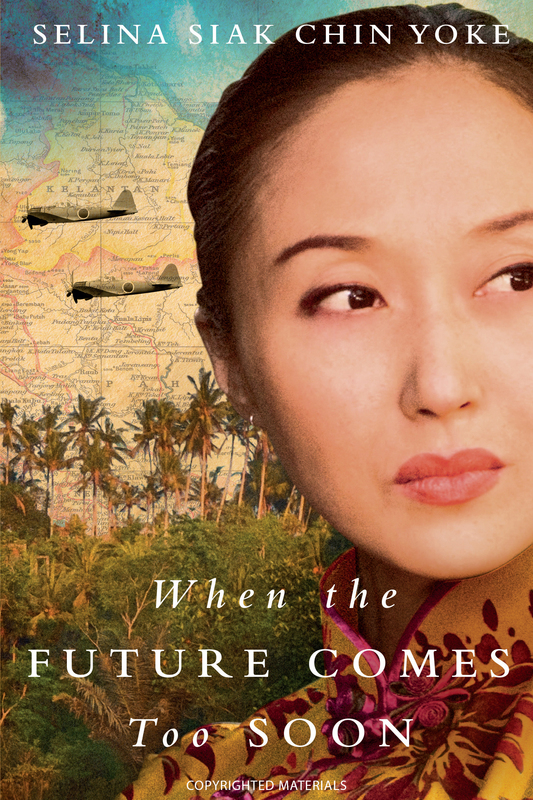 In When the Future Comes Too Soon, Malaya is at war and occupied by the Japanese. The story follows an ordinary, middle-class family – the Wong family – through the three and a half years when their country is turned upside down. The narrator, Wong Mei Foong, who is a young woman on the eve of the Japanese invasion, must find ways to survive with her husband and their five children. For those who’ve read The Woman Who Breathed Two Worlds, Mei Foong is the first daughter-in-law of the matriarch in that previous novel. Every Malaysian family has its own memories of the Japanese era. As a child, I was fascinated by that period and clamoured to hear my family’s stories. I devoured these tales without fully understanding their implications, and it was only while writing this second novel that I have come to appreciate how profoundly Japan’s occupation of Malaya changed our country. Some of you must be wondering how it is that my second novel is coming so quickly! My literary agent, Thomas Colchie in New York, spent nearly two years looking for a publisher for my first manuscript, but when Thomas agreed to work with me, he knew I was planning a series. Naturally, he advised me to start writing the second book while he continued searching for a publisher for the first work. I had already completed two drafts of When the Future Comes Too Soon when Thomas came bearing the sort of message every aspiring author wants to hear. At that point, I had to stop writing – life just became too exciting! As the process of preparing my debut novel for publication got underway, I went back to my second manuscript and continued polishing it. When I finally felt that it was ready to be shown to the world, I sent it off to Thomas and his wife, Elaine, who approves all the manuscripts that pass through their literary agency. I cannot tell you how nervous I was! This second novel is quite different – necessarily so, since the country is ravaged by privation – and I had no idea how anyone would react. When Elaine’s response came through one night, I had to calm myself before daring to open her email. I then walked on air for the next few days because she told me how much she loved it. And it is thanks to you, dear readers, who gave my debut novel – The Woman Who Breathed Two Worlds – such heart-warming reviews, that Amazon Crossing quickly made an offer on the second manuscript and is bringing the finished book to you as early as they can. I hope you adore the front cover as much as I do – it presents a powerful image, as vivid as the first. For this superb art work, I must once again thank the entire design and production team at Amazon Crossing, plus the artist, David Drummond, and of course my editor, Elizabeth DeNoma. There are now three months to go before publication. Am I nervous? Absolutely. Excited, but nervous, too; I’ve poured so much of myself into this book. I really hope that you, the reader, will like it. When the Future Comes Too Soon is already available for pre-order. Below is a selection of links you can use. So happy for you and so proud of you!